Brining your pork chops before grilling helps increase the flavor and helps prevent losing moisture during the cooking process. This recipe uses a basic brine of kosher salt, brown sugar, peppercorns and bay leaves. They are best when brined for up to 8 hours, so prepare the pork in the morning for grilling that evening. The pork chops are then grilled and served with sauteed peppers and onions that have been seasoned with red pepper flakes and vermouth. 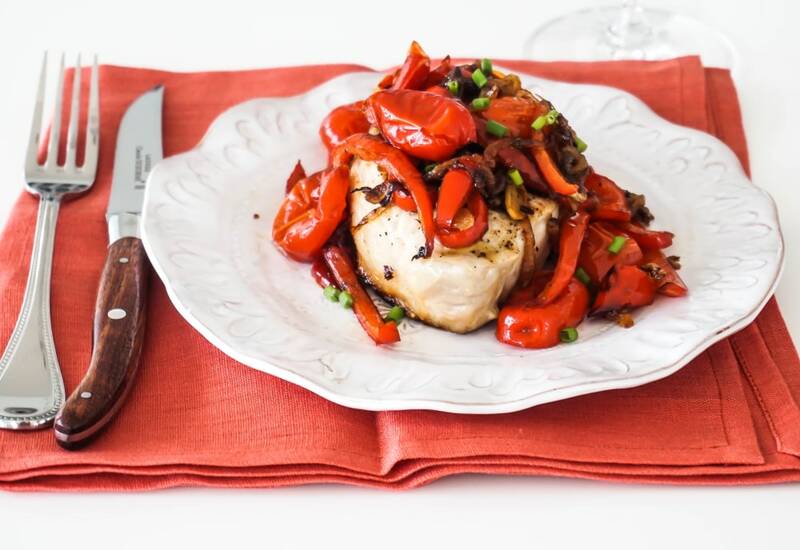 in this recipe for pork chops served with sauteed onion and pepper. Remember to allow the pork chops to rest for at least 5 minutes before digging in! Resting pork allows it to stay tender and juicy. Per Serving: 407 calories; 11g fat; 59.1g carbohydrates; 12g protein; 33mg cholesterol; 28522mg sodium. I made these pork chops and they were fabulous! The recipe was slightly labor intensive, but definitely worth it in the end. They chops were extra flavorful and moist, probably one of the best pork chops I've ever made! The pickled peppers and onions were also superb. I really love these grilled pork chops! The peppers and onions were perfect on top. The meat was juicy, tender, and full of flavor. Definitely a new favorite.